Brightly lit, compact, cosy and Christmassy inside, Richmond rarely fails to be one of London’s most welcoming theatres at this time of year. For most of the locals, a visit to the annual panto is a family tradition and, on the back of last year’s successful, raucous and chaotic Biggins-fest ‘Aladdin’, we arrive expectant for this year’s ‘Peter Pan’. We’re in Neverland within the first three minutes in this fast-moving production. A little top heavy with song and dance, it’s left to Robert Lindsay and ‘BGT’s Jon Clegg to keep things ticking. 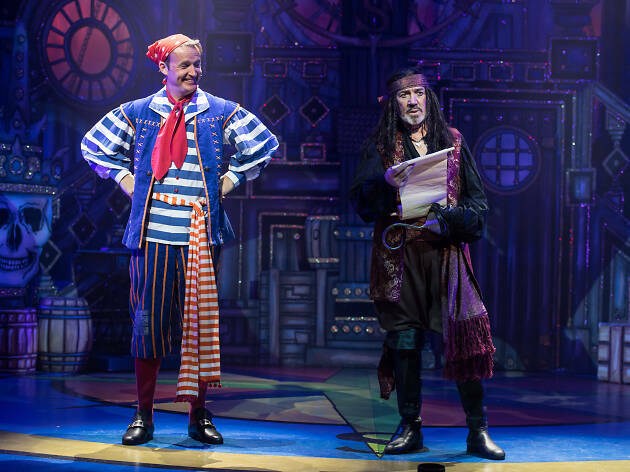 Surprisingly this is Lindsay’s first go in pantomime, but you’d never guess: he’s a scene-stealingly perfect baddie as the villainous Captain Hook. 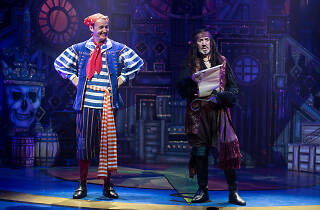 Clegg, as Smee, is everyman enough to keep the crowd going after yet another song, and between the two the majority of jokes are funny and, in the main, aimed for the adults in the audience – nevertheless, ‘Old MacDonald’ and a rendition of ‘Baby Shark’ seemed more than enough to keep the kids happy. With Harry Francis’s Pan spending most of his appearance 15 feet up on strings, plus bangs, whizzes, an abundant use of smoke in most scenes and a giant croc at the end of the first half there’s enough here to have families wide-eyed and cheering – and planning in next year’s visit.